Going gluten-free? On February 9th 2014 The Gluten-Free EatUP! 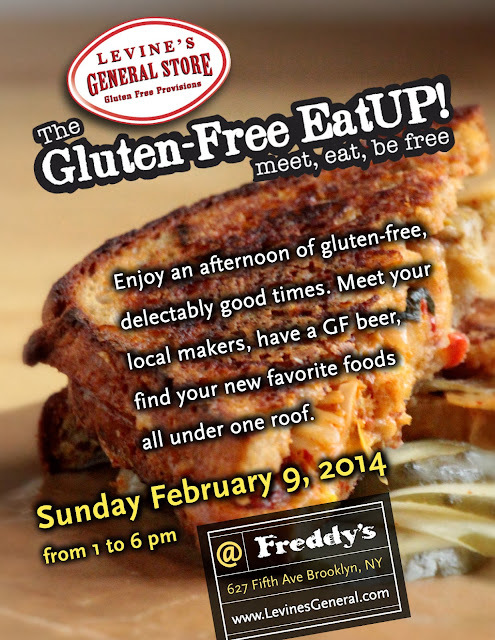 launches as a monthly marketplace of locally crafted, gluten-free, taste-full delectables, at Freddy’s Bar in Brooklyn. This monthly event is made possible by Levine’s General Store, a provisioner of fine GF foods. Beat the winter blahs and step inside the warming cozy atmosphere of our favorite local, community oriented bar. Try a spicey Kimcheelicious grilled cheese, grab a glutenous free beer, take home some sweets ( for your Valentine perhaps?). Enjoy an afternoon of locally crafted gluten-free foods. Hot Savories. Sweets. Packaged Treats & More Surprises. So you’ll come, you’ll EatUp! Meet. Eat. Be Free. Kimcheelicious is one of the sponsors and a vendor at this event. Shop in for gluten-free, vegan kimchee!